Crops spawn randomly in the wild, with each individual type spanned out over an 8x8 chunk grid. This means the player will have to explore quite some distance in order to gather every single type of crop. Wild crops only generate between the seasons of Spring and Late Summer, and have a chance to regenerate during those seasons every year. Harvesting a crop will always drop at least a single seed, as well as increase the player's agriculture skill by 1. The higher the player's agriculture skill, the more likely that a second seed will drop as well, allowing for farm expansion. Planted crops mimic real life in how long it takes for them to grow before they can be harvested. Note however, that these values have been scaled to fit within the length of a TFC year which by default is only 96 days. ¹Bell Peppers can be harvested both when the pepper is immature: green, and ripe: red or yellow. ²Will survive freezing temperatures while still young. ³Very sensitive to the cold. Can die at temperatures as high as 5℃. The majority of harvested products from matured crops can be eaten directly by the player, making them a renewable source of food. Farmland, also known as soil, contains three basic nutrients for crops and gives your plants that important access to water, if any source is close enough. By using the water and nutrient modes of metal hoes you can get a visual indicator on the plots on the levels of nutrients and the access to source water. Nutrients are diminished by the growing of crops in the soil and replenished over time by either letting the plots "fallow" for a season, using fertilizer, or by planting your crops in cycles, choosing a crop that has a different nutrient requirement than the ones that are depleted in the earth. Note: Some crops such as soybeans and green beans replenish the other nutrients as they grow. Unlike in vanilla, farmland cannot be trampled or reverted back into dirt. Breaking a farmland block also yields no dirt as a way to prevent nutrient exploitation. If true converts all instances of onions to rutabagas. The number of days in a year. Must be a multiple of 12. Values greater than 360 will cause crop growth issues. Find a wild vegetable None Harvest a wild crop. Find a rutabaga Gatherer Pick up a rutabaga from the ground. Hoes can be used on the new dirt and Crops may grow and be planted. Only wheat is a viable crop as of this patch. The first phase of agriculture has been added including 19 new crops with several more to come in future patches. Harvesting tomatoes can be done via right click which will revert the plant back a few stages and allow it to produce more food. Crops grow based upon the current temperature, amount of sunlight they receive, water saturation, and time. All crops have an average amount of time that they will take to reach maturity which is directly affected by the temperature and nutrient levels. Tilled soil stores information about the nutrient levels in that plot of dirt. There are 3 separate nutrient groups for soil called A, B and C.
Water saturation is no longer tracked. A mechanic similar to vanilla is in place where not having water nearby confers a negative bonus to growth speed. Scythes can be used to harvest crops. Warning! Using on tomatoes will yield nothing. Pick them by hand. All Crops may be broken down into seeds by placing the item into your crafting area. 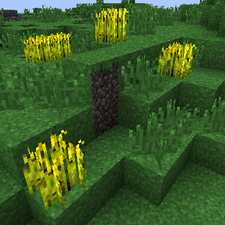 Crops can be found growing wildly in patches in newly generated chunks. Hoes now have 3 new modes available to help farmers tend their crops. Wild crop rarity increased from 1 in 4 chunks to 1 in 9 chunks. Crops no longer die from old age by default. Added a config option 'enableCropsDie'. Set this to true if you want more of a challenge. Snow makes crops immediately fail unless they are very young and are marked as being frost resistant(Onion, Garlic, Carrots, Cabbage). Get straw from removing grain from crops and use of knife/scythe on grass. Wild crops should now respawn every year between the seasons of Spring and Late Summer. Wild crop world generation altered so that different crop types will be harder to find. Seeds can now only be obtained through harvesting crops. Fertilizer can be used on crops on tilled ground. Crops which die from any method other than the old age config option will give a seed back. An example of a wild patch of rye. This page was last modified on 20 November 2014, at 19:15.